Set a few years after the events of Cat People (1942), Ollie (Kent Smith) and his wife, Alice (Jane Randolph) now have a daughter by the name of Amy (Ann Carter). Amy is an imaginative child, but a lonely one as well. Ollie worries that she lives too deeply in her own fantasy world and encourages her to play with other children. Amy befriends an elderly actress named Julia (Julia Dean) who is convinced her own daughter is an imposter. Amy wishes for a friend, and a mysterious woman appears named Irena (Simone Simon) who looks identical to Ollie’s deceased first wife. Ollie refuses to accept Irena’s fantasy life and she finds herself spending more and more time with Irena who may be just be the imaginary friend of sad little or something much more sinister. 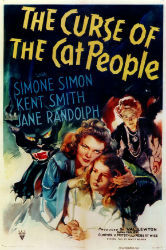 Curse of the Cat People is a sequel to Cat People only in that it carries over a few characters. There are no actual Cat People in this story, the smoldering sexuality of the first film has been replaced with a melancholy wistfulness. This isn’t a horror movie in the traditional sense, more of a drama with supernatural overtones. The only real menace comes from adults pushed to extremes. The moment when Ollie decides to spank Amy to punish her for having an imaginary friend is played for more horror than any interaction between Amy and the ghostly Irena. This is a beautifully filmed story that exudes just enough darkness to keep from becoming maudlin. Curse of the Cat People is a curious choice as a sequel, but a touching film on its own.